The award was presented to company executives at Westchester’s Earth Day celebration at Croton Point Park on Sunday, May 18. In 2013, the companies constructed a steam line linking the Wheelabrator Westchester waste-to-energy plant to White Plains Linen’s neighboring commercial laundry. Steam from Wheelabrator Technologies’ Westchester waste-to-energy facility is used to power White Plain Linen’s laundry equipment and room heating systems, reducing the facility’s natural gas consumption by 90 percent. This steep reduction in the laundry’s natural gas usage eliminates 4,775 metric tons of greenhouse gas emissions annually, equivalent to taking nearly 1,000 passenger vehicles off the road. 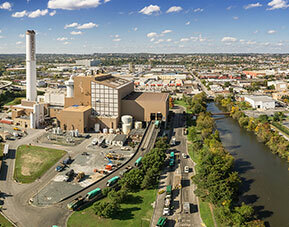 Designed, constructed and operated by Wheelabrator Technologies, the Wheelabrator Westchester plant processes up to 2,250 tons per day of municipal solid waste. Inside the plant, waste is transferred to utility-type boilers that recover thermal energy in the form of high pressure steam, which is converted to electrical power by a turbine. The plant generates 60,000 kilowatts of electricity — enough to power 88,000 New York homes. A wholly owned subsidiary of Waste Management, Wheelabrator Technologies Inc. is a leader in the safe and environmentally sound conversion of municipal solid waste and other renewable waste fuels into clean energy. Wheelabrator owns or operates 17 waste-to-energy facilities that provide safe waste disposal for towns and cities across the U.S. Wheelabrator also operates four independent power plants designed to generate electricity using an assortment of fuels, including waste wood, waste coal, and natural gas. In addition to producing electricity, some of these facilities also produce steam sold to nearby government and commercial establishments. Wheelabrator’s 21 facilities have a combined electric generating capacity of 853 megawatts, enough energy to power more than 900,000 homes. To learn more, visit www.wheelabratortechnologies.com or tweet us.